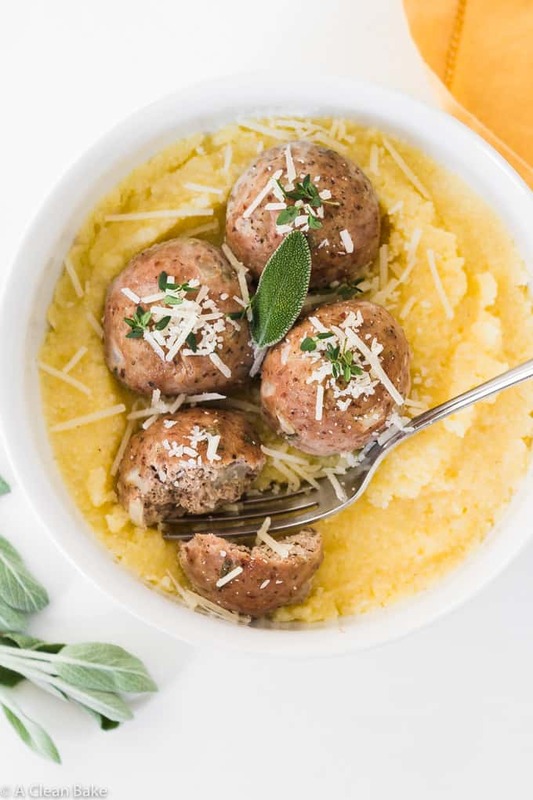 Paleo turkey meatballs are a healthier alternative to red meat-based meatballs, and this version is gluten free, grain free, low carb, and Whole30 compliant. With that kind of healthy pedigree, you’d expect them to be bland and tasteless, but they’re actually moist and full of flavor, thanks to the unexpected addition of fresh sage leaves. These turkey meatballs can be fried in a pan or oven baked, depending on your preference. Once cooked, they’re freezer-friendly, too! If you had told me that adding grated onion and fresh sage actually makes for the best turkey meatballs, I would have looked at you funny. No way, I’d insist: weirdly woodsy, too much moisture, just icky all around. I would have been very, very wrong. This is an update to an old recipe that, upon revising it, I decided was not quite right. It was good – don’t get me wrong – but the proportions were just a little off. The original contained apple, which imparted too much moisture and interfered with the texture of the meatballs. The onion should be grated, not chopped, the balls needed a tad more salt. Most importantly, the old pictures were, frankly, not doing the recipe any favors. Sometimes the best part about blogging is seeing how far you’ve come. Sometimes, it’s discovering old recipes in the archives that you’ve forgotten about that, it turns out, are exactly what is missing from your (ok, my) boring dinner rotation. I love turkey meatballs because they’re a little leaner and lighter than your typical meatball might be. So, you can eat more of them without feeling like you swallowed a bowling ball. But they can be tricky to make, which is why you may be reading this going “no way. I’m not making those. Turkey meatballs are gross”. They’re not gross if they’re prepared and cooked well, I promise! So many of them aren’t, but let me give you a few tips for making enjoyable turkey meatballs. These turkey meatballs are baked instead of fried, which is why they lack that telltale golden crust in the photos – but they are perfectly adaptable to a pan if that’s your preferred cooking method. The trick to making them, you know, edible is cooking time. You obviously want to make sure these are cooked through. But you don’t want to overcook them since turkey has a tendency to dry out quickly. So, what does that mean for your ‘balls? The range will depend on your oven, but in a 400 degree oven (an actual 400 oven, as determined by an interior oven thermometer. You use one, right? ), they will take around 25 minutes. 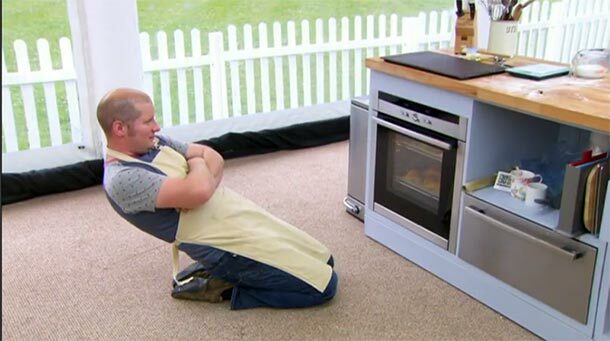 If your oven runs warm, it may be closer to 20 minutes; cool, and you may be looking at something closer to 30. So, watch them carefully. You’ll know the meatballs are done when the white fat has oozed out and pooled around the base of each meatball. Gross? Yes. An accurate gauge of doneness? Also yes, unfortunately. Don’t stress about it too much. Just add some cheese (not Whole30 unfortunately) if they spent a little too long in the oven. 😉 Or even if they don’t! 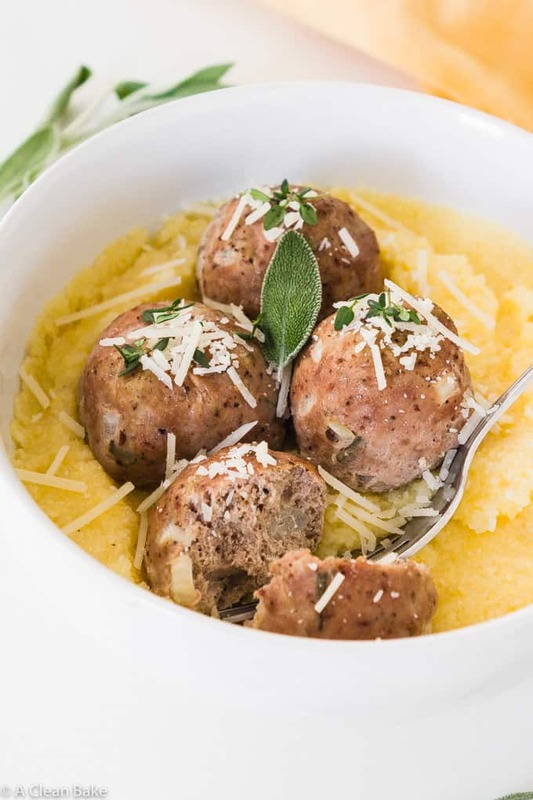 What else do you need to know to make great paleo turkey meatballs every time? Don’t use extra lean turkey. You’ll typically find “regular” ground turkey at around 96% lean, and that is fine. Those extra few percentage points worth of fat are the key to making a turkey meatball a moist and delicious entree, as opposed to the dry wads resembling packing material that most people are quick to assume turkey meatballs will taste like. Mince your onion. It should be absolutely as fine as you can get it; use a grater if possible. Watch the moisture. Onions are both very high in moisture, and too much moisture can result in a gummy or sloppy meatball. No thank you! Avoid meatball mediocrity by gently squeezing the moisture out of the shredded onion before adding it to the turkey mixture. The easiest way to drain the excess moisture is to put the grated onions in a fine mesh sieve (<–that’s an affiliate link to buy one on Amazon, if you don’t already own one), place a small bowl on top and press down until the moisture drains out the bottom. Bake, then freeze. Paleo turkey meatballs freeze really well, but they should be rolled, baked, and fully cooled before you stash them in the freezer. I don’t recommend freezing the raw meatballs. Or enjoy immediately. Serve over polenta (shown), your favorite gluten free pasta or grain, or vegetable noodle. Garnish with minced fresh parsley and grated parmesan cheese (if not on a Whole30) to serve. 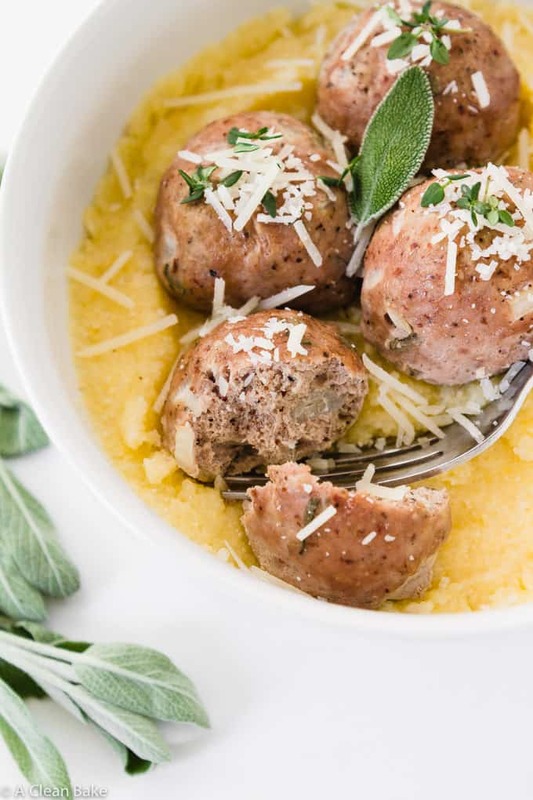 Want more paleo turkey meatball recipes? You can try this classic variety made in the slow cooker (<– I make this one about once a week or so), and this one with an extra serving of veggies packed inside. Paleo turkey meatballs are a healthier alternative to red meat-based meatballs, and this version is gluten free, grain free, low carb, and Whole30 compliant. With that kind of healthy pedigree, you'd expect them to be bland and tasteless, but they're actually moist and full of flavor, thanks to the unexpected addition of fresh sage leaves. These turkey meatballs can be fried in a pan or oven baked, depending on your preference. Once cooked, they're freezer-friendly, too! Preheat the oven to 400°F. Line a large baking dish or sheet with a silicone nonstick pad and set aside. In a large mixing bowl, mix all of the meatball ingredients until well combined. Scoop the mixture into 2 Tablespoon portions, and roll each portion into a ball. Place the meatballs on the prepared baking sheet (about 1-2 inches apart) and bake for 25 minutes or so, until the fat has begun to seep out of the meatballs, and no pink meat remains in the center. Serve immediately, or cool completely before freezing. Don't use extra lean turkey. You'll typically find "regular" ground turkey at around 96% lean, and that is fine. Those extra few percentage points worth of fat are the key to making a turkey meatball a moist and delicious entree, as opposed to the dry wads resembling packing material that most people are quick to assume turkey meatballs will taste like. Watch the moisture. Onions are both very high in moisture, and too much moisture can result in a gummy or sloppy meatball. No thank you! Avoid meatball mediocrity by gently squeezing the moisture out of the shredded onion before adding it to the turkey mixture. The easiest way to drain the excess moisture is to put the grated onions in a fine mesh sieve (<--that's an affiliate link to buy one on Amazon, if you don't already own one), place a small bowl on top and press down until the moisture drains out the bottom. Bake, then freeze. Paleo turkey meatballs freeze really well, but they should be rolled, baked, and fully cooled before you stash them in the freezer. I don't recommend freezing the raw meatballs. Throwing together a quick marinara sauce is the easiest way to spruce up an otherwise boring dinner. My version may not be authentic, but it is versatile, made from pantry ingredients, and only takes 30 minutes. 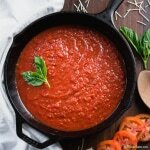 When you have to get dinner on the table STAT, start with this gluten free, paleo, vegan, and Whole30 friendly sauce! Thanks, Colleen! They *are* really flavorful! Wowww, those meatballs actually look amazing. I totally believe you; I need to try this (: Plus, the fact that it is a handy “use-it-up” recipe…even better! 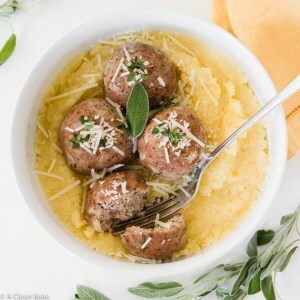 Love this Fall-inspired twist to meatballs! I always make itlaian type meatballs but I like the idea of sage and apple…will have to put it on the to-do list! Usually I go with the Italian method too, but these are worth making an exception for! Those meatballllllz! 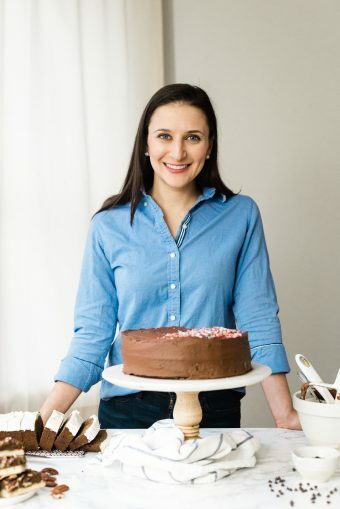 I’m doing Whole30 right now and have found meatballs to be my ultimate comfort food 😀 I’ve actually never baked them, so I’m definitely needing to try this method. Looks lovely, m’dear! Just made these and they are amaaaazing! They remind me of thanksgiving stuffing. I followed the recipe exactly, only swapping out the regular eggs for duck eggs, which I find to give a nice richness to dishes that are prone to being dry. And they are juicy and delicious! Thanks for letting me know and the addition of duck eggs sounds incredible! Is there a good sauce you recommend to pair with these? They look delicious!